Shadowman #15 (Valiant/Acclaim 1993) *High Grade copy. 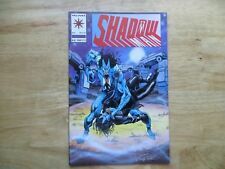 SHADOWMAN #16 (1993) VALIANT COMICS 1ST APPEARANCE OF DOCTOR MIRAGE! MOVIE! Shadowman comics lot of 2. Valiant. 1993-94. Excellent! This page was last updated: 22-Apr 16:10. Number of bids and bid amounts may be slightly out of date. See each listing for international shipping options and costs.